Our PTFE Coated Fabric Cloth combine the easy release and heat resistance of PTFE with the strength and dimensional stability of fiberglass, creating a coated fabric suited for a variety of demanding industrial applications. Dimensional stabile in a range of temperatures from -60°C to +260°C. Our fabric is non-toxic, odorless, tasteless, and is FDA compliant for use in food processing, package and handling. 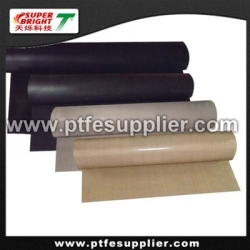 The fabric is made from woven fiberglass cloth that has been coated with PTFE. And also offer the added benefits of durability and extremely low elongation(<1%).